The Global South-South Development Expo was hosted by the Republic of Turkey in Antalya, Turkey from November 27th to November 30th. The theme of the expo was “South-South Cooperation in the Era of Economic, Social and Environmental Transformation: Road to the 40th Anniversary of the Adoption of the Buenos Aires Plan of Action (BAPA+40),” with the aim to discover and develop solutions to scaling up South-South cooperation as a pathway for transformative development change. On Thursday 30th, Small Grants Programme co-hosted a side event with UNDP and UNOSSC called “South-South cooperation helps communities scale up solutions to achieve the SDGs.” The side-event featured a lively discussion on scaling up community solutions to sustainable development, and showcased several innovative solutions to salient development challenges. The event also introduced two platforms intended to foster solutions exchanges in the South, UNDP’s SSMart of SDGs platform and SGP’s South-South Community Innovation Exchange Platform. 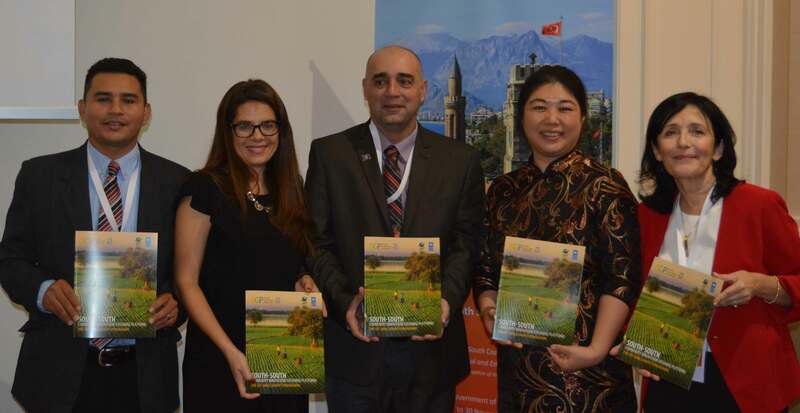 GEF SGP’s most recent publication, “South-South Community Innovation Exchange Platform: The experience of the Small Grants Programme,” was also launched at this side event. Ms. Xiaojun Grace Wang, Deputy Director of the UN Office for South-South Cooperation placed the foundations for the discussion and introduced the Small Grants Programme. She highlighted the importance of South-South cooperation and triangular cooperation as a modality of achieving the SDGs at the local community level, as well as nationally. 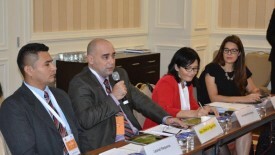 Ms. Simona Marinescu, Chief, Development Impact Group, UNDP, noted that UNDP was the largest developing agency of the UN system with an annual budget of US$ 5 billion, of US$ 15 million are invested in South-South exchanges. Ms. Marinescu talked about UNDP’s engagement in triangular cooperation with the Republic of Korea on communities’ inclusion for best practices local development. UNDP has recently launched its SSMart for SDGs platform and a brief demonstration of its function was given on the example of Women Solar Engineers in Africa and Barefoot College. In her intervention, Ms. Ana Maria Currea, Communications and Knowledge Specialist GEF SGP, said that the SGP during its 25 years of operation have worked with over 20,000 communities and shared three examples of knowledge sharing across countries. The Dominican Republic had an exchange on water management, with Haiti; an organic certification programme was created between Jamaica and Barbados; and Cuba shared its knowledge in soil fertility and irrigation with several Pacific Islands. The GEF Small Grants Programme has learned some key lessons in how to engage successfully in South-South cooperation: networks are crucial;concrete plans of action are needed; it takes time; and South-South cooperation is key as a platform to scale up innovations. Mr. Leonel Requena, GEF SGP National Coordinator in Belize, noted that a critical element in the network are peer-to-peer knowledge exchanges. Including local communities means “allowing the developing process to work”. SGP also takes a mentorship approach and are engaged in the training of trainers. “The voices of communities need to be heard at all levels”, he said.